What am I reading that is challenging my thinking? I am in the midst of reading a number of different pieces that are causing me to think about the classroom in different ways. I am not exactly sure how they are all related, but I have a strong feeling that they are. First, Living on the Future Edge, a book written by Ian Jukes, Ted McCain, and Lee Crockett, paints a very interesting picture of the future. We live in a world that is changing exponentially. The authors present four trends that are impacting global societies in amazing ways. Trend 1, Moore’s Law, is the exponential growth of computer technology in which data storage, processing speed, and working memory are doubling every 12 months with the associated costs decreasing dramatically. Trend 2, Photonics, represents the enormous changes in how data is transmitted across fiber optics and wireless platforms. Trend 3: The Internet, with 2 billion users in more than 180 countries, sharing information or communicating. Facebook, Twitter, YouTube, Skype, Wikipedia, and Second Life are just some examples of internet resources that are transforming how we communicate and share information. The authors ask the question, “What’s Next?” The World Wide Web is transforming the world we know. What does it mean to prepare students in 2010 for the world they will inherit 10 years from now. Trend 4, InfoWhelm is the immense accumulation of new information that is changing every 24 hours. “How about the search for global warming? More than 31 million references to global warming in 0.11 seconds. ?” (1) Too much for anyone to process. Students need to acquire the skills to not remember or know all this information, but to discern what is important, relevant, and necessary. “This begs some fundamental questions, though. What types of skills and knowledge will people need to have to effectively use devices? What will individuals need to = sort through the massive amount of information available?” (1) The authors wonder whether schools are preparing students for this world. They don’t so. 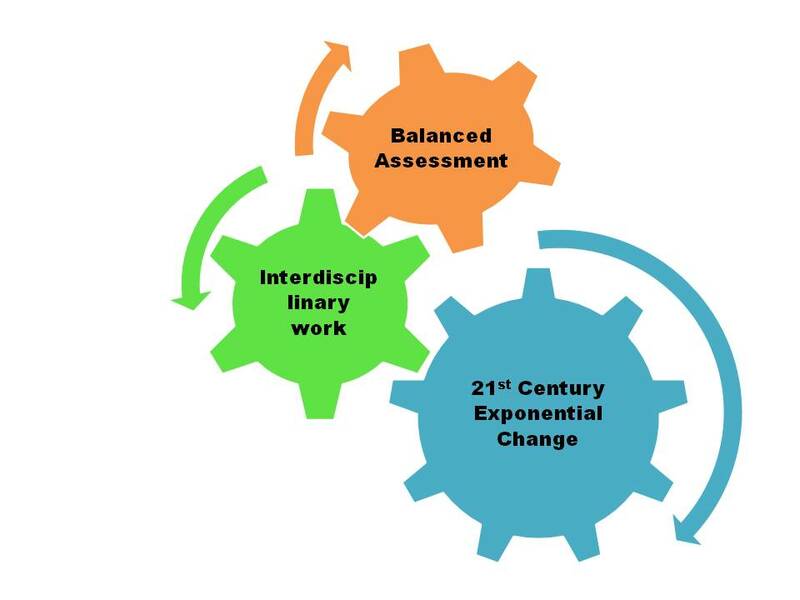 Check out the 21st Century Fluency Project that outlines approaches to addressing the 21st Century skills question. The second piece I read that has resulted in me wondering about how we educate students is an article in October 2010 edition of JSD written by Ryan R. Gogel and Nick Sousanis. The article is entitled, A Different Kind of Diversity. (You will need to be a member of Learning Forward to read the article for free) They promote an educational environment that honors the value of interdisciplinary connections. The authors write, “when we as teachers don’t reach outside our discipline to connect to content that might be of interest to our students, we increase the risk that our students might miss out on the richness of the subject we are trying to explore.” (2) In this sense, disciplinary specialization in schools create learning environments with narrow perspectives. We know from the types of problems that we face in the 21st Century that students will be called up to think about complex problems crossing many disciplines. Take the BP oil spill in the Gulf of Mexico during the summer of 2010. People involved had to be able to navigate environmental science, crisis management, deepwater engineering, water quality, marketing and communication, and political skills in resolving this challenging problem. Are we preparing our students to think critically and synthetically across the disciplines? Are our teachers prepared and trained to help create a more relevant, connected, and interdisciplinary curriculum? The authors would suggest that the answer is no to both questions. We need to prepare are students to be innovative, to think critically and solve problems that span the disciplines. Mihaly Csikszentmihalyi (1997), Sir Ken Robinson (2001), and Howard Gardner (2007) all argue that we need to teach our students to work across the disciplines to develop their creative thinking capacity. Gardner writes about the value of the synthesizing and creating minds, two of his five minds for the future. Again, are our schools preparing students? What do you think? Lastly, I am reading the book, Assessment for Learning: Putting it into Practice, by Paul Black and his colleagues. In order to create a transformation of the learning environment in the 21st Century, we must transform how we assess student learning. I have written other blog postings on this topic. We assess students too much and assess them the wrong way. There is too much summative assessment that tests what they are suppose to have learned, and too little formative assessment that assess what they are learning along the way. Many educators are convinced that unless we change the assessment landscape any innovation of the learning environment will be temporary. In closing, we need to prepare students for the exponentially changing world they are growing up with a new paradigm for teaching and learning. We need to create more relevant, interdisciplinary curriculum that connect students to the challenging problems we face. Finally, we need to transform our assessment practices to include more formative assessment, assessment for learning, and rely less on summative, high-stakes tests.